It goes without saying that Jon Richardson is my all time favourite comedian, he never fails to make me laugh and I have been lucky enough to see him perform live twice. I was even able to meet him *eeeek* which is up there in my top 10 moments ever. Of course, with any comedian, when the going gets good the tour DVDs and autobiography's start appearing and the appearances on panel shows increase. This all happened to Jon Richardson, he went from being just a stand up comedian to being team leader on 8 out of 10 cats, then came the book and then the DVD. You can imagine my joy at being able to see my favourite comedian be embraced by the public and I was straight out there buying his book when it was released. 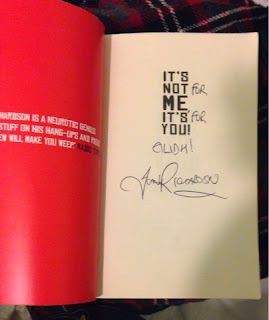 Where Jon Richardson differs is that his book isn't an autobiography as such. It doesn't go into his childhood or teenage years, instead it is advertised as some warped guide to relationships- I use the term guide loosely because in reality it is just 294 pages of Jon Richardson telling us about how all relationships are doomed and in his true self deprecating style we learn about his years of living alone, where a Saturday night activity was cleaning the skirting boards and drinking alone. It is a quick, lighthearted read and one of my favourite offerings from the stand up comedy world. At the age of 30ish I think it would have been useless for him to go down the autobiographical route. Can you really have lived enough to write a whole book on it? So, would I recommend it? 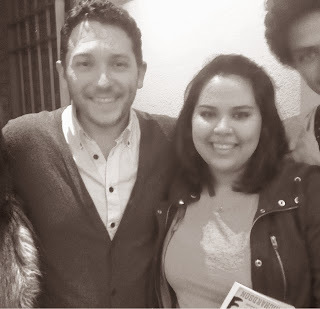 Yes of course, I mean, its Jon Richardson, duh!